*Author's note: The screening of Sunrise at the Plaza Classic Film Festival was accompanied by an original score by My Education performed live. As part of the review, the music will be mentioned. There are some films that will never lose their relevance, their potency, or their ability to move one emotionally regardless of how long ago it was made. Sunrise: A Song of Two Humans is that type of film. It has this power because in its remarkably simple story we see how love can overcome all the obstacles placed before it. The visuals within Sunrise are still striking, I daresay spectacular, creating spellbinding imagery both dreamlike and highly representative of German Expressionism. That no doubt is due to Sunrise's director, the German F.W. Murnau, and while the film is a thoroughly American production the style is so evocative of German Expressionism (the skewed angles, the dual imageries) that one can imagine it coming from Weimar Germany. It is not just the beautiful imagery within the film, but the gentle story as well, one of the true power of redemption. In an unnamed coastal village, A Woman From the City (Margaret Livingston) has managed to seduce The Man (George O'Brien), a farmer. 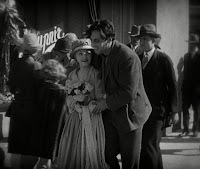 In the throes of passion, The Woman From the City urges The Man to sell his farm and get rid of The Wife (Janet Gaynor). This can be done through murder. The Man is appalled, but his lust is too strong, and he reluctantly agrees to get rid of her. The Wife, despondent at The Man's infidelity, is now thrilled when he asks her to go with him on a boating trip. Innocently, she goes, but becomes alarmed as he becomes more aggressive. As she cowers and begs for her life, The Man cannot go through with it. He rows back to shore, but the Wife, now terrified of her husband, flees. The Man goes after her, begging her to forgive him. Too frightened to believe him, she won't look at him. The trolley they took takes them to the city, and while he repentantly gives her flowers and bread, she is still too terrified to look him in the eye. It is only when they come across a wedding and she sees his total, heartfelt repentance, that she finally forgives him. Now, The Man and The Wife spend the rest of the day rediscovering their love. They have a 'wedding picture' taken, where the two of them so passionately in love so enchants the photographer that he photographs them kissing rather than the formal stance they posed for. They go to a fair where they share a Peasant Dance, and sail back home, totally in love and having forgiven everything. However, they run across a powerful sea storm. The Man remembered the reed bundles on the boat he was use to secure himself when he had planned to murder The Wife. Tying her to them, the storm capsizes the ship and The Man manages to survive. The Wife is nowhere to be found. Observing the search is The Woman From the City. Convinced that The Man has gone through with the plan, she comes to him. Now he is filled with murderous rage towards her, and comes close to killing her when The Maid (Bodil Rosing) rushes to him, telling him The Wife has survived. He goes to her, and in the Sunrise, their true love survives, while the Woman From the City leaves with nothing to show for her efforts. Sunrise has some extraordinary sequences, starting from the beginning. The opening title card soon shifts from a simple drawing to coming alive. 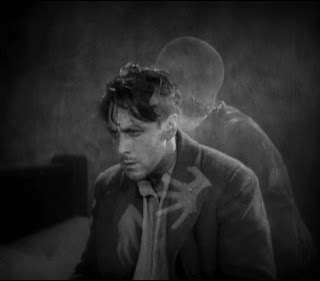 There are also some extraordinary sequences that are so incredibly dreamlike. One (of many) that sticks out is when The Man and The Wife have reconciled. They begin walking away from the wedding, looking like a disheveled bride and groom, and as they start walking away from us they manage to avoid the traffic and soon it looks as if they have wandered into a beautiful field, culminating in a tender kiss...only to be rudely awakened by the traffic they are holding up in the middle of the street. This so captures the rhapsody of love to where everything does fade away. Again and again the beautiful cinematography and special effects within Sunrise make this a magical film, one where the visuals tell us so much, both subliminally and literally. When The Man is debating within himself to commit a foul deed, we see The Woman From the City as a series of shadows, luring him to a mad act of desire. Later, as the Man walks towards the rowboat, the family dog keeps barking, determined to join them. Is the Dog aware of The Man's wicked, wicked thoughts? It is only in our mind that we can get that idea, but the brilliance within Sunrise is that we can read that without being specifically told the Dog knew what evil thoughts entered the Man's mind? Because Sunrise is a silent film, the music is highly important. My Education's score for the film is both traditional and contemporary. The opening music was appropriately tender and sad, but when The Woman From the City arrives, we hear a sultry, seductive sound to accompany this designing woman. The music by My Education provided a thrilling, intense experience, in particular when the squall hit. We fear for The Wife, and become concerned that despite their rediscovered love it was all for naught. Fortunately, we get a happy but genuine ending. The performances are equally excellent. Janet Gaynor won the first Best Actress Oscar for Sunrise (along with Seventh Heaven and Street Angel, the only time an Oscar was given for three films rather than for one). She is all innocence and heartbreak as The Wife, with her mournful eyes telling us so much. George O'Brien is also strong as The Man; the genuine repentance and regret he shows when pleading for forgiveness is truly moving. Sunrise is a film that endures and will endure because it has both beautiful imagery and a genuine, simple, sincere story within it, one that people can relate to. Granted, not all of us plan to murder our spouses, but there hasn't been a point when we haven't hurt someone we care about in some way. We will always be drawn to stories that speak to us about the true power of love and forgiveness, even those that do not use voices.